Taking a stroll in this lovely Collared Swing Dress from MissCandyFloss, the Blue & Grey Plaid Contrast makes for a lovely combination. I am definitely getting 1940s Femme Fatale Vibes in this beauty from their Femme Fatale Collection which I LOVE, I pretty much want to own every piece. 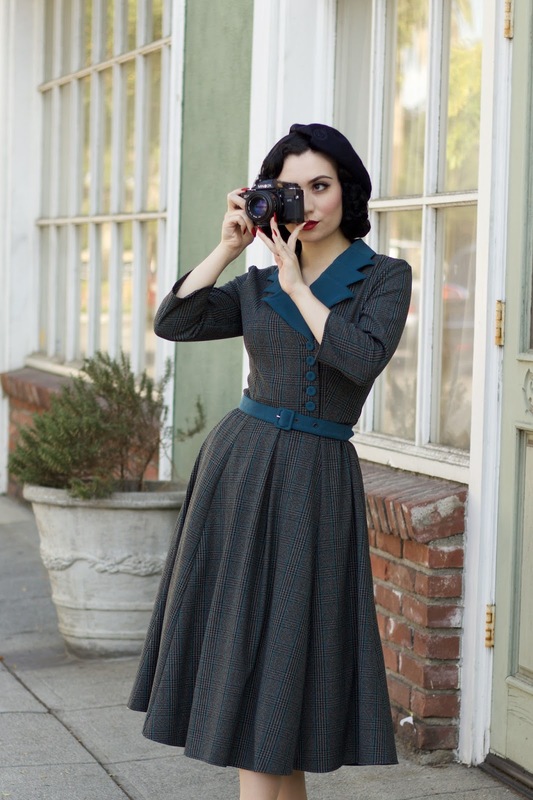 When I first laid eyes on this swing dress I was captivated by its color palette & collared neckline, it reminded me of a style that a Detective Dame would wear in a 1940s Film Noir picture. I was inspired by 40s fashion, so I paired this lovely dress with some T-Strap heels, Seamed Stockings, & a Vintage Beret. Beauty Products from Besame Cosmetics. I love 1940s Business wear especially when it has that Feminine touch, one of my favorite styles of Vintage Business wear was the look that Lilli Ann achieved in the Blazer & Pencil Duo. I felt that it really embodied Elegance & Female Empowerment, which are the types of qualities that a Femme Fatale has. The fit & details are lovely, especially the Collared Button Blazer, it really is thee show stopper feature on this dress. The Plaid Pattern looks like an authentic vintage print & it is perfect for Fall & Winter.